John Mills Sterling was born at Newark, New Jersey, in 1904. He graduated from Culver Military Academy, attended Princeton University, graduated from the U.S. Military Academy and was commissioned a second lieutenant of Field Artillery on June 14, 1927. After serving with the Field Artillery for two years, General Sterling then began flight training. Graduating from flying schools at Brooks and Kelly fields in Texas, he was rated a pilot in February 1930, transferred to the Air Corps and assigned with the First Pursuit Group at Selfridge Field, Michigan. In 1931, he was transferred to the 18th Pursuit Group at Wheeler Field, Hawaii, and three years later was reassigned to Selfridge Field. From 1938 to 1940, General Sterling served as assistant military attache for Air in France and Belgium. After the fall of France he remained in Paris under German occupation for several months. returning to Selfridge Field in 1941 he commanded the 58th Pursuit Group until ordered to Washington D.C., in October 1942 for duty with the War Department General Staff. Transferred to the Southwest Pacific in March 1943, the general was named commanding officer of the Air Defenses in New Caledonia. He became assistant chief of staff for operations of the 13th Air Force in that theater in October 1943, and in July 1944 was appointed chief of staff of that organization. General sterling became deputy chief of staff of the Special Plans Division, War Department General Staff, Washington, D.C., in June 1945. He entered the National War College in August 1946, graduated in June 1947 and was assigned to the Central Intelligence Agency, Washington, D.C. In September 1950 he became acting chief of staff of the 5th Air Force at March Air Force Base, California, and in April 1951 was named chief of staff. From October 1953 until October 1956, the general served as air attache at the American Embassy at London, England, and in November 1956 assumed duties in the Office of the Secretary of the Air Force as a member of the Secretary of the Air Force Personnel Council. General Sterling retired from active duty service July 31, 1957. His decorations include the Legion of Merit with oak leaf cluster, Bronze Star Medal, Air Medal and the French Legion of Honor (Chevalier). He is rated a command pilot and technical observer. 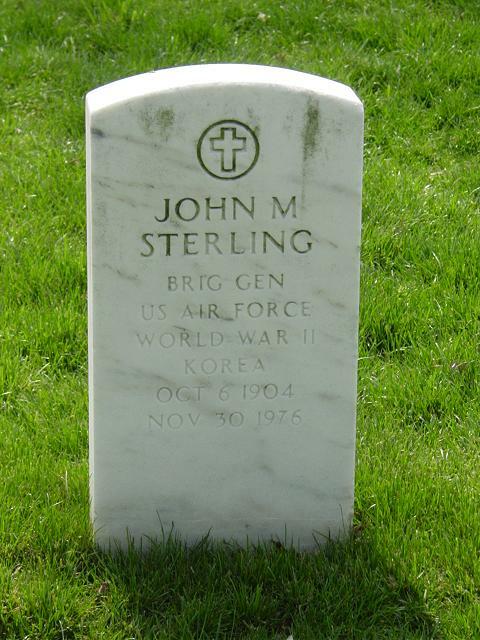 General Sterling was buried with full military honors in Section 34 of Arlington National Cemetery.